RUGGED AND RELIABLE: Battery packs are built in rugged aluminum chassis, machined out of a single brick of aluminum for reliable operation on the field. Only high-quality Li-Ion batteries are used. LARGE CAPACITY: Battery packs have up to 384 Wh capacity. This will ensure 3 hours of operation for SBOX data logger with 32 channel SIRIUS DAQ system without replacing batteries. 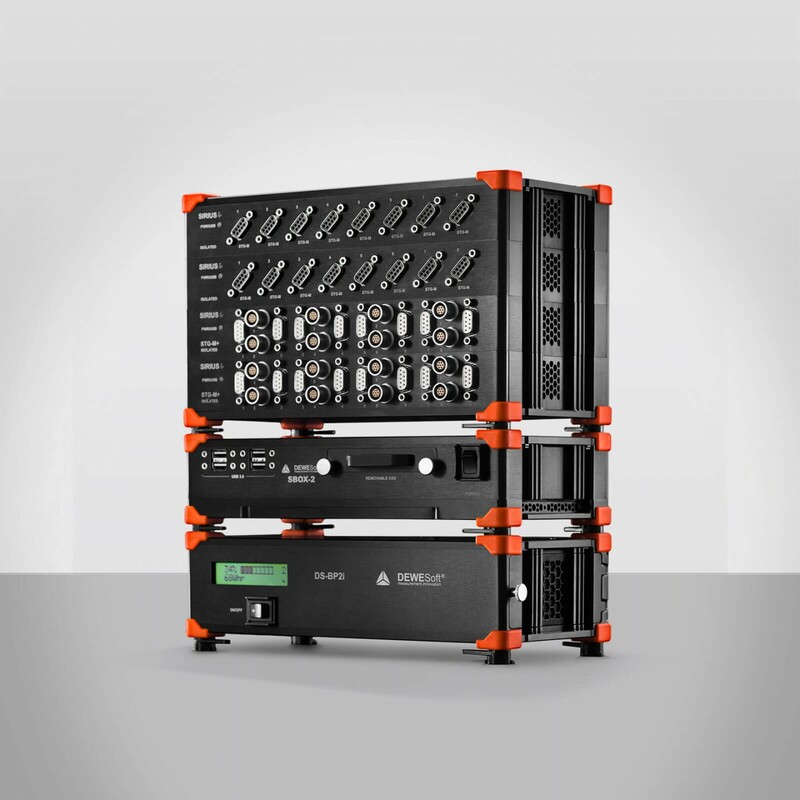 HOT-SWAP FUNCTIONALITY: Internal Li-Ion batteries are hot-swappable, meaning they can be replaced during the measurement to ensure your data acquisition system never runs out of power. ISOLATED POWER SUPPLY: For in-vehicle measurements, an isolated power supply on battery packs will guard you against unwanted ground loops. STATUS INDICATOR: Battery packs come with LCD status indicator as well as USB connection to the DAQ unit so you will always know how much power you have left. REVERSE POLARITY PROTECTION: Battery packs are protected against wrong connections to the input power supply. Both battery packs - DS-BP2i and DS-BP4i are engineered to work perfectly together with our SIRIUS data acquisition and SBOX data logger instruments. Clever click mechanism will enable the battery to attach to SIRIUS and/or SBOX instruments. Battery packs ensure enough power for your on-road and field test and measurement applications so you don't have to worry about losing any data due to lack of power supply. DS-BP2i total capacity is 192Wh and DS-BP4i total capacity is rated to 384Wh. In other words, DS-BP4i can run 32-channel isolated SIRIUS DAQ systems together with powerful SBOX data processing computer and data logger for 3 hours. And that is by also providing power to 32 sensors! And if you need even more power for your measurements, both battery packs have hot-swapped functionality, meaning you can exchange internal Li-ion batteries on the fly during measurement and extend power even further.